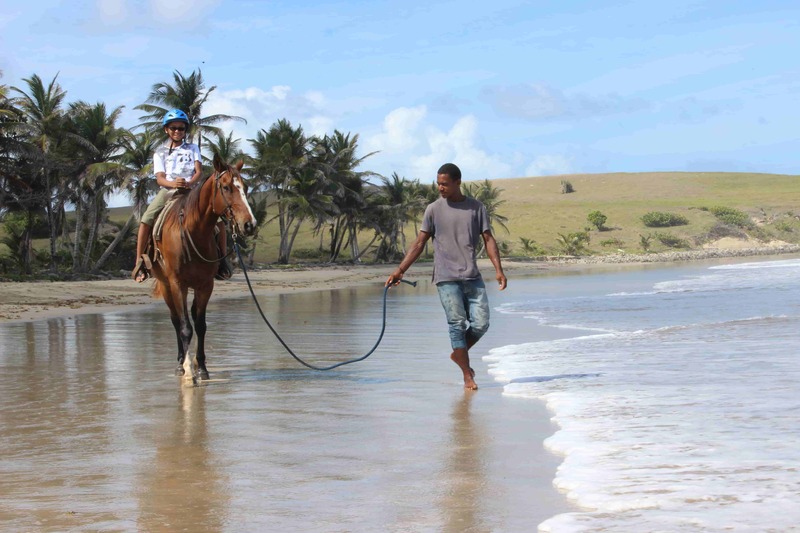 Many have dreamt of riding a horse along the sandy beaches of a tropical island. 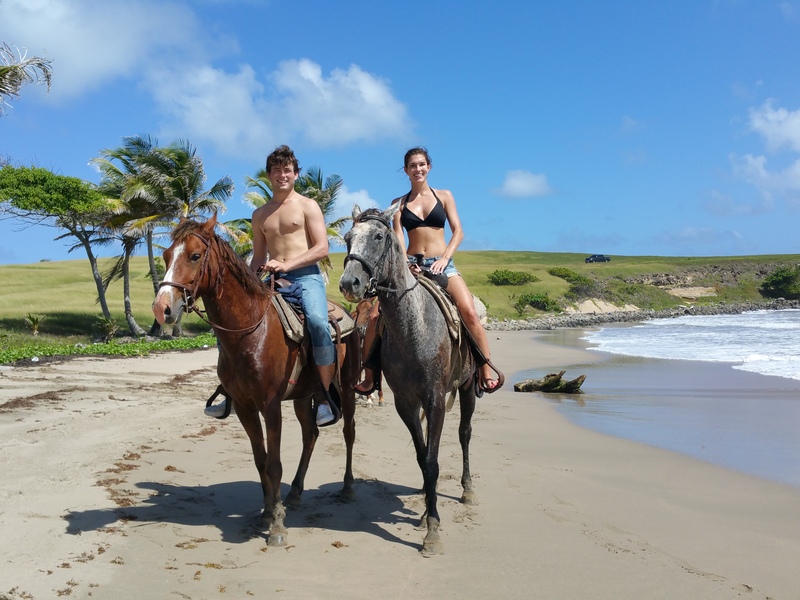 Located on the southern tip of St. Lucia, Atlantic Shores Riding Stables is the quintessential stop to experience in the Caribbean. Whether you are coming from a cruise ship or island resort, this stables is fit for an adventure for the whole family. Surrounded by breathtaking ocean views, we offer guided trail rides through the peaceful countryside and along pristine beaches. Experienced riders and beginners will have a wonderful time here with our friendly guides and our horses. Let us enhance your vacation in the tropics and take you riding along some of the most enchanting lands on this beautiful island. Focusing more on smaller groups, you will venture out on horseback to ride on either a 2 hour Beach Ride priced at $65USD or a 3 hour Country Trail Ride priced at $75USD. 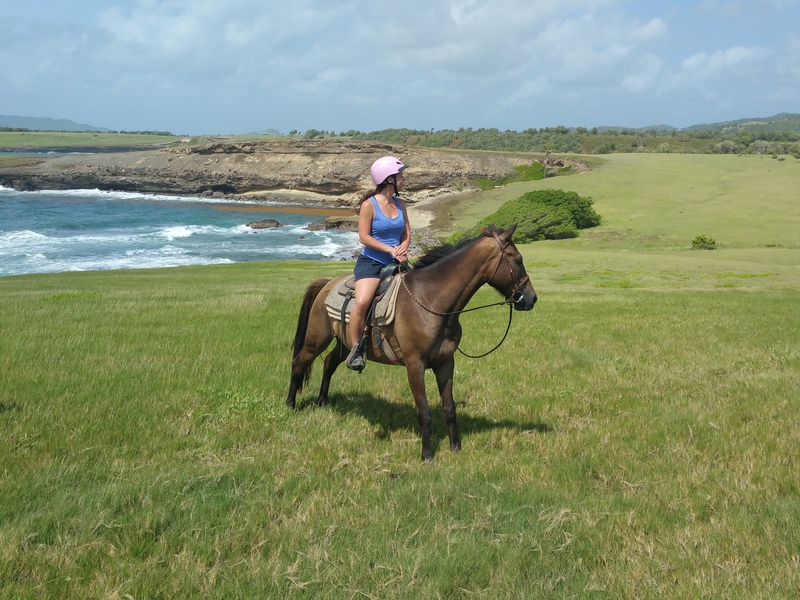 Each ride will take you through gently rolling hills with velvety soft grasses, dramatic and steep sea cliffs towering over turquoise waters, and private beaches where experienced riders can enjoy a gallop through the powder-soft sands. If the weather is right, you may even spend some time splashing with your horse in the warm Caribbean waves. You will have plenty of opportunities for photographs while on horseback, and your riding guide will introduce you to the history and culture of this tropical oasis.This is the perfect opportunity to get away from the lounge chair and comforts of your resort to enjoy an amazing tropical adventure. Transfers are offered at a price for anyone arriving by cruise ship or from your private resort on the island. What a phenomenal company! We planned our ride at Atlantic Shores Riding Stables for several months. Wayne made this phase very enjoyable with specific details on prices, add/on’s (lunch), driving instructions from our Soufriere Villa , etc. We rode on 16 Feb 2017 and everything about this experience was 5+Stars. The varied scenery from banana plantations, to wide open spaces, to beautiful beaches, to paths high up and looking down at the ocean was exilerating. The picturesque memories will last a lifetime. The stables and guides were top-notch. We ate at Island Breeze and the view, food and drinks were outstanding. If you want an exceptional riding experience, regardless if you are an experienced or beginner rider, you will not go wrong with this Stable. The price is right, the planners outstanding, and the ride exceptional. A special shout out to Wayne for putting this wonderful experience together! Many thanks and warm Regards to the entire team at Atlantic Shores Riding Stables.